Dress for success in the horse biz. The Gorgeous Horse is your source for handcrafted equestrian jewelry. 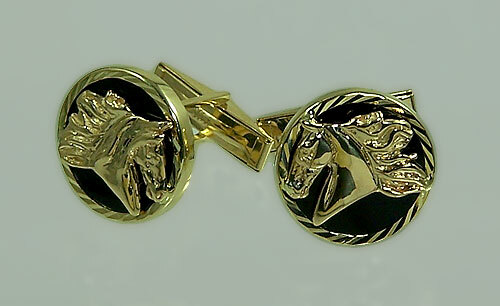 Make that suit really standout with these spectacular horse head cuff links. Crafted from yellow gold and black onyx creates a style all of its own. Great gifts for the horseman in your family. Dimensions: 3/4 inch in diameter. Available in 14kt yellow or 14kt white or sterling silver.